Congratulations to the 2013 Summerall Guards! 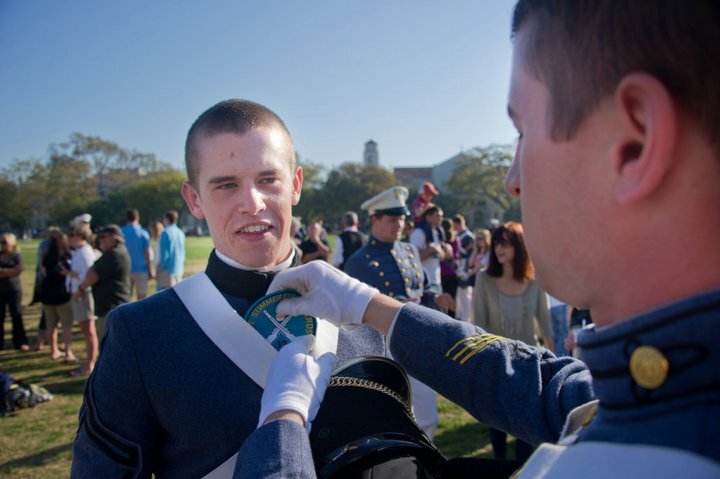 My Facebook feed is lighting up with congratulatory notes for the new members of the 2013 Summerall Guards. Cuts Day was yesterday when the 2013 BVA’s were put through their paces. The school usually posts the full list right before Corps Day. Be sure to make your hotel reservations now for the weekend of March 16-18. The rifle exchange usually happens Saturday morning. 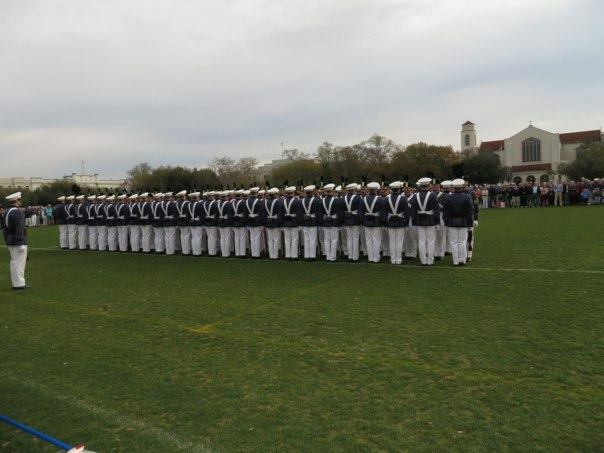 Last year the outgoing 2011 Summerall Guards did not do the whole Citadel series before passing their rifles to the 2012 BVA’s, now the 2012 Summerall Guards. 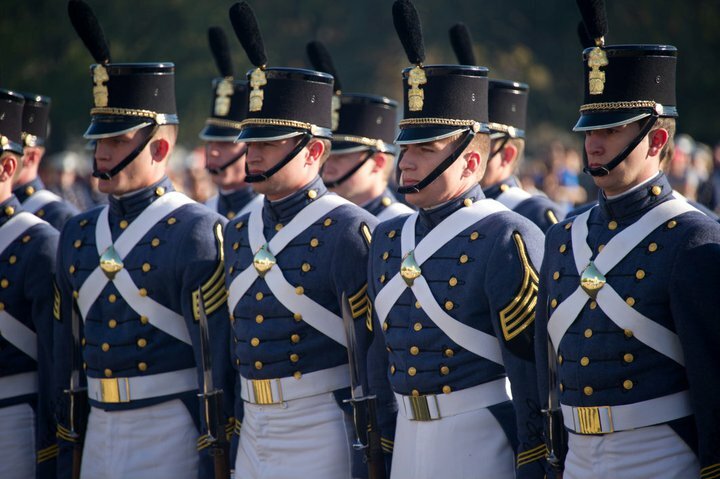 Prior to March 17 be sure to ask your son whether he will be closer to the stands or the chapel side of the field as they march out. That way you will know what side of the field to stand on to take photos. Be sure to meet as many other Summerall Parents as you can so you can share photos and video. Fortunately many of the families post their videos to YouTube. 2012 Bond Volunteer Aspirants march onto the parade field. photo by Stanley Leary. They host a BBQ lunch that afternoon. You can purchase your Summerall Guards Parent t-shirt at the luncheon. It is a fundraiser for the Summerall Guards to help pay their expenses. Their first big performance is the Azalea Festival in Wilmington, NC. Well, February is here. 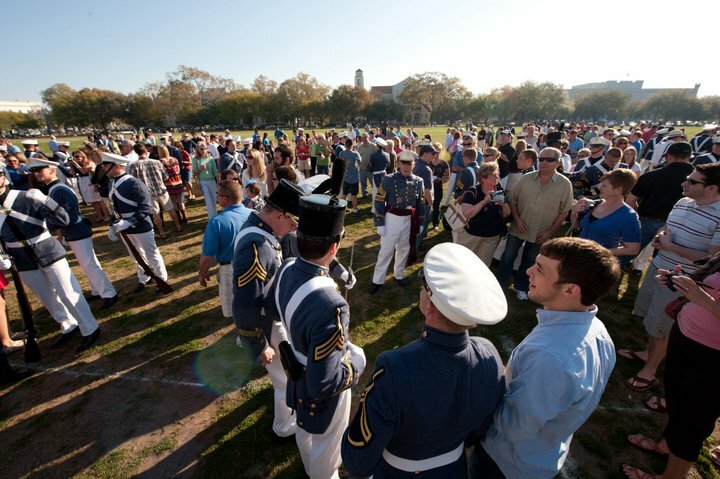 At The Citadel that means the Bond Volunteer Aspirants (BVA’s) are moving close to Cuts Day. I checked the training schedules the other day to find that Cuts Day for the 2013 BVA’s is Feb. 6. *NOTE: since this posting a parent has told me Cuts Day is delayed until Feb. 14. if you have other information, please post it to the comments section below. 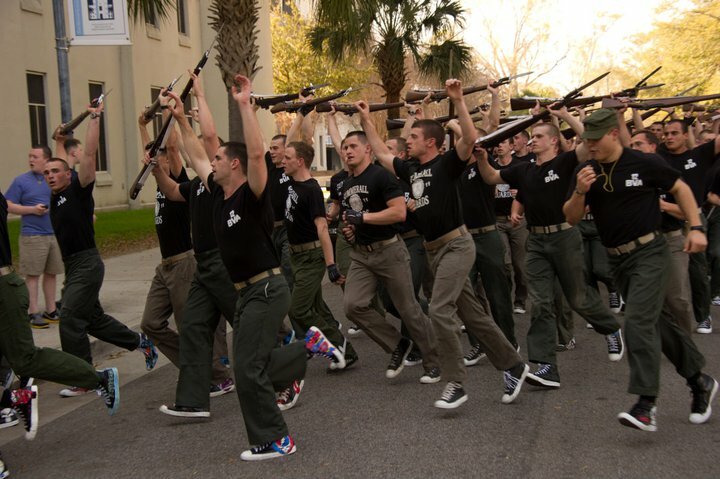 While the BVA’s look forward to Cuts Day as the end of their training period, the current Summerall Guards are moving closer to their trip to New Orleans, LA and Mardi Gras. The time has flown by since my son was a junior and BVA. We waited anxiously to hear if he had made the Summerall Guards. I combed the internet for photos of their first big appearance after Corps Day at the Azalea Festival. I’ve written about our journey before but this time of year the memories come flooding back. I’ll include a few tips here for parents of both the BVA’s and Summerall Guards. Be sure to ask or email your BVA and have a plan for how they will inform you if they have made it. I logged onto Facebook the night we thought my son would find out and began to see congratulatory messages being sent to some cadets. My son went tot he gym to work out that night and we received a call from him on his way back to the barracks. Once they find out they have made it, practice for their first appearance on Corps Day begins. The Mardi Gras schedule is usually known sometime in January. This year the Summerall Guards posted the schedule to their Facebook group page. I’ll include the schedule here in case you aren’t on Facebook. The Times Picayune posts news, photos, videos and more on their website. I watched one parade via their web cam last year. 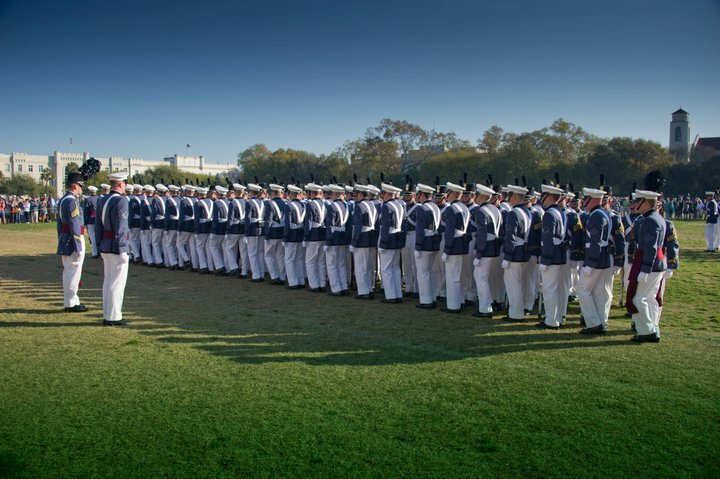 Corps Day Weekend 2012 is March 16 – 18. 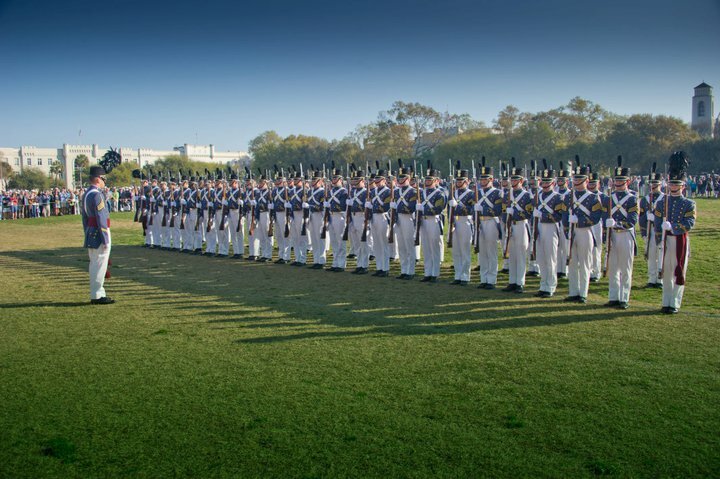 On Saturday the current Summerall Guards will march onto the parade field first. The schedule is posted to the main website about a month ahead of time. Last year the 2011 Summerall Guards did not do the entire series. They marched out did an abbreviated series then prepared to greet the BVA’s. The BVA’s march onto the field and in a very moving ceremony they take their rifles from the preceding class of Guards. 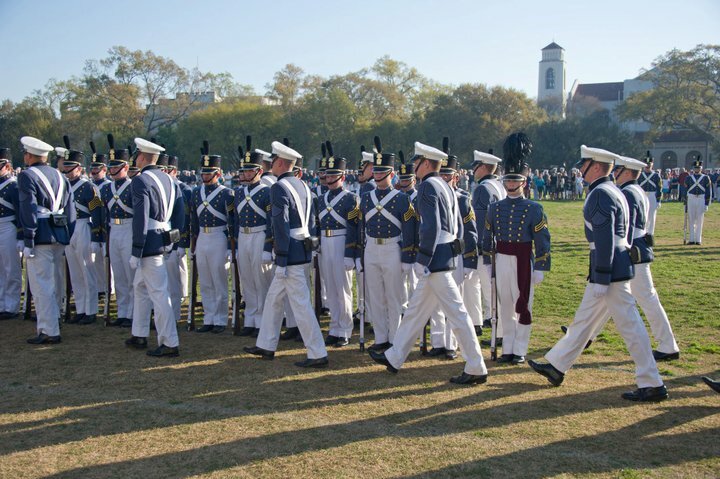 One tip: find out from your cadet if when they march out they are on the side closest to the barracks or closer to the Summerall Chapel. This will help you know where to stand to watch. My son was in the barracks side 5 rows back on the end. We stood in front of the reviewing stands right on the rope. 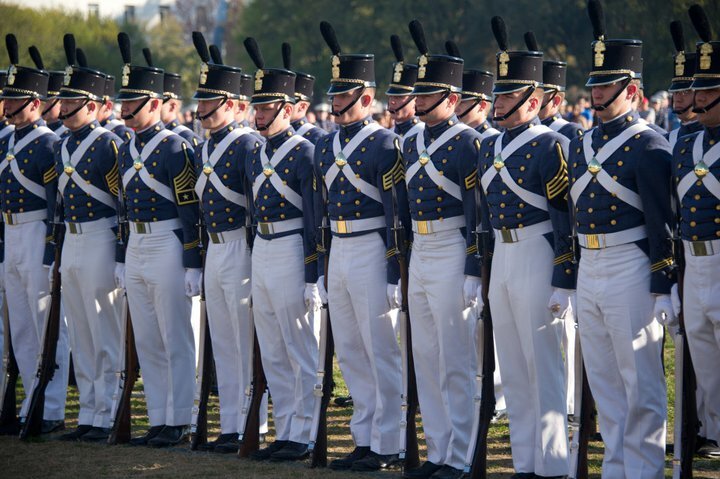 As with the parades it is really hard to tell the cadets apart. Knowing their position will help you get great photos. While the new class goes through their performance of the series the out going Guards kneel to one side and watch. When it is over the new guards receive their patch from one of the out going Guards. They usually have a fundraising BBQ lunch. At the lunch you’ll have the opportunity to purchase the Summerall Guards Parent and Supporter t-shirts. The 2012 Summerall Guards set up a web site to sell the t-shirts and receive donations. I’m not sure that will be continued with the next class. 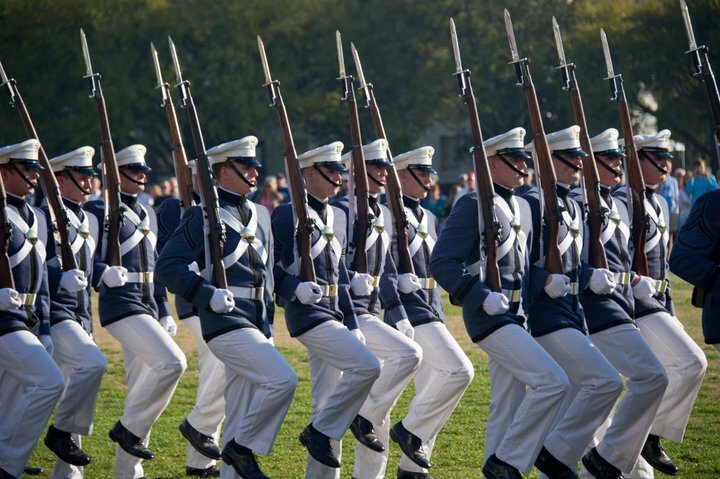 The first big performance of the new Summerall Guards is the Azalea Festival in Wilmington, NC. I found photos through the official website and the local newspaper. The festival now has their own Facebook page too. The Summerall Guards act as escorts for the young ladies (high school aged) who are called Belles and serve as guides for the tour and festival. I don’t know many families that attend this festival. If you live close by and can post photos for the other families I’m sure everyone will appreciate it. A quick search on YouTube will turn up scores of videos posted of the Summerall Guards over the years. I’ve noticed the number of videos increase each year. Be sure to introduce yourself tot he other families of the current guards. You can share photos and videos with each other. A great way to commemorate your cadet becoming a Summerall Guard is to purchase a nutcracker made by Carolina Cadets. She usually sells ornaments at a table during Parents Weekend and other major weekends. I ordered mine online. Best wishes to all the 2013 Bond Volunteer Aspirants and their families! A special thanks to my husband, photographer, Stanley Leary, for the photos. You can see all his photos of Corps Day 2011 here. To see what the ceremony looked like March of 2010 see this clip. THe passing of the rifles is at about the 6:50 mark. A video of the March 2011 is here. 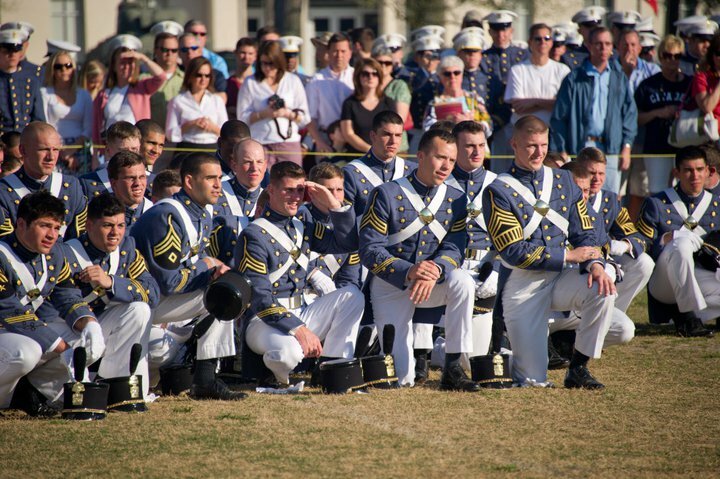 The 2011 Summerall Guard watch as the 2012 Summerall Guard perform the Citadel series for the first time. I was looking over the site stats for the blog Off the Base. It is fun to notice the articles that are found because people are using Google to find out information. The beginning of the school year the entries about knobs and Matriculation Day are the most frequently searched. Second to that is BVA’s and Summerall Guards. Junior year is when cadets who want to be Summerall Guards volunteer to go through intense training. They are called Bond Volunteer Aspirants. In many ways it is like knob year, only this time it is worse. 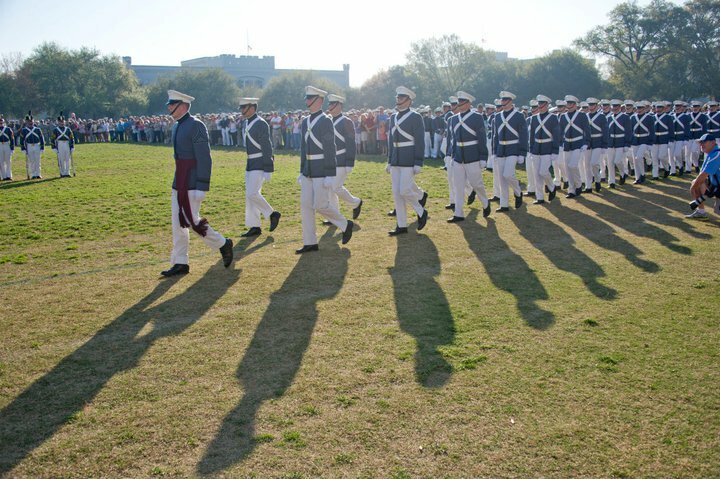 The juniors represent some of the top leadership in the Corps of Cadets. They have a heavy load of classes and duties that their advance rank brings with it.. They volunteer to go through intense physical and mental challenges. The “fun” begins first semester, but the really intense period occurs after the break at Christmas. I mentioned in an earlier entry how anxiety producing this junior year is for parents. It is widely known on campus that the BVA training is tough. Very little information is available to parents who are anxious. The best advice I can give parents of the BVA’s, let your cadet contact you. Do not expect to hear from them as often as you did the years before. Send them encouraging emails, and care packages. Try to understand they need all their focus to squeeze in tine time study train and get their jobs as officers completed. The waiting is the hardest part. Remember, just support your cadet. They will let you know if/when they need help getting the various required items like the high top Chuck Taylor shoes and fatigue pants. You can find background information online. I’ll include a few tips and web links to help. The Summerall Guard Parent and Sponsor t-shirts are sold by the Summerall Guards as a fund-raiser. Be sure to buy yours from the new Summerall Guards on Corps Day. They are usually sold at the BBQ lunch that is held as a fund-raiser.